Loughcrew, Sliaḃ na Caillíġe , Gaelige for Hill of the Old Woman, is an extensive collection of more than 30 chambered megalithic passage tombs atop a range of hills on the western border of county Meath. Most of the cairns are located on two hills, Carnbane East and Carnbane West. The illumination of the Newgrange passage and chamber by the Winter Solstice sunrise is world famous. 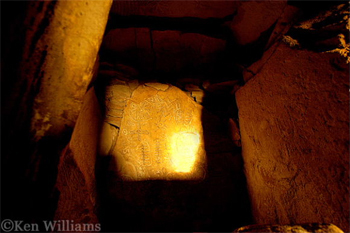 Less well known is the similar illumination of the passage and backstone of the chamber of Cairn T at Loughcrew at the Spring and Autumn Equinox sunrise. Mrs. Gatty ( The Book of Sundials, Gatty, Mrs. Alfred. London: George Bell & Sons, 1900.) did not comment on Newgrange or Knowth, they would have been grass covered mounds at the time she wrote her famous book. She did however observe that "The Journal of the Society of Antiquaries of Ireland gives drawings of stones at Dowth and Lough Crew with drawings of small circles on them, either crossed or rayed, and with central holes. 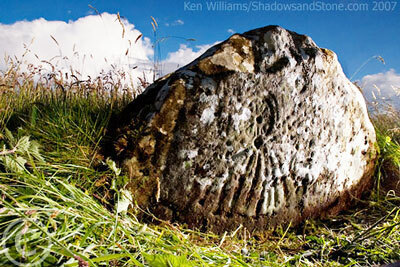 A stone on Patrickstown Hill, Lough Crew shows a small rayed circle with a central hole, and below the circle a double semicircular arrangement of rays terminating in round holes, very much like some of those which we still find on churches." 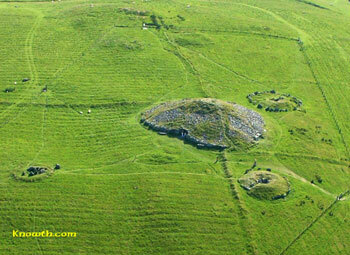 The Loughcrew cairns are located 80Km north west of Dublin, west of the town of Kells and south of Oldcastle.